repairing the background behind it. Redo his hairline and add hair highlights. Part 1 covers removing the Purple Stripe from the eye area using the Cloning tool and doing a quick clean up swipe with the Soften variant of the Retouch tool. In Part 2 we will clone off his top pony tail, replacing it with the bluish background. We will use a gaussian blur on the blue area to meld it with the rest of the background, then add noise again replacing the lost "grain". If you haven't already done so, I suggest applying the latest 7.02 patch to PSP 7 before doing this tutorial. This subject matter is pretty advanced stuff in that it will take a LOT of your time practicing to master it. }: Some of you might not like this tutorial since you will have to make a bunch of decisions on your own. I will NOT be documenting or explaining every stroke since it took me over 1000 steps to complete part one. I will explain the tools I used, their settings, and some technique tips to help you get started with the Clone Brush. Then you take the face image and work on it! All I can suggest is practice practice practice, patience, patience, patience! Yes, this is Khiba's mean and nasty twin, Sheba, teaching today. Think of this as a test, testing your own patience and persistence levels and your ingenuity. Accepting the challenge is up to you! Mastering the Clone Brush puts a powerful weapon in your digital image editing arsenal! With all that said, here is the project. A lovely kid, eh? Well, the story is that his grandmother wants to see this picture taken of him at the Kiss. As his Mom, fictitiously of course, I am not about to let GranMOM see him all painted up and scalped like an alien from the planet Gazp. 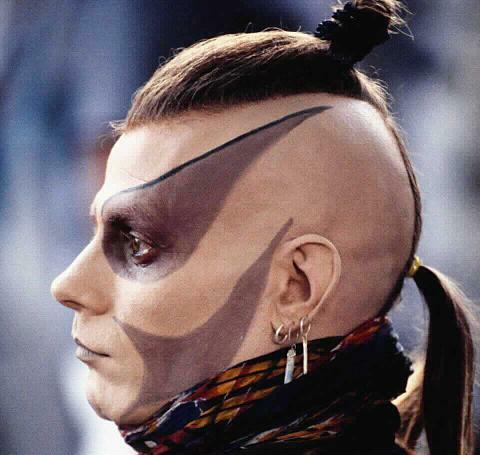 Since it's a quality photo, except for the facial decorations and the long ponytail in back, it's prime material for a work over. Let's fix him up. Your assignment for this week is to clone out at least one of the purple stripes from his face replacing with regular flesh. The tools I used were: Freehand Selection Tool, the Cloning Tool, and the Retouch Tool. At the end I used Effects > Noise > Add Noise. We are going to keep this very simple. Click the link to open the full size version of the image above, then right click and save as PaintedFace.jpg on your hard drive. Fire up PSP and click the word File on the Menu Bar at the top of PSP then OPEN from the flyout box. Browse to the folder where you saved PaintedFace.jpg, select it then press the OPEN button. Pick the Zoom tool from the Tool Palette and click in the image to zoom to 1:1. Notice the noisiness of the photo, the grain, so to speak. Move the image around using the scroll bars until the purple stripe running from the eye up the head is all visible in your PSP window. Pick the Freehand selection tool from the Tool Palette, the Lasso thingy. Open the Tool Options Palette with the "o" key on the keyboard if its not already showing. On the Options palette, set the following: From the Selection Type dropdown box, pick Freehand. Be SURE to UNcheck both Feather and Antialias. Leaving these checked results in a nasty ring around the selection after cloning. Click and drag an selection around the purple area including the eye. Then press and hold down the CTRL key on the keyboard to put the freehand selection tool in the subtract from mode and click and drag around the actual eye. Release the mouse button and the CTRL key when finished. Notice there is a hole in the selection around the eye. This selection protects both the eye and the rest of the face from accidental clone overs. Better safe than sorry. It might take a few tries to get a good selection here, but when it happens, save it to both the DISK and to the Alpha Channel so you never have to recreate it again! On the Save Selection Area box, name the selection something like PaintedEye.sel and press the save box. Go back to the Menu Bar and Selections and pick Save to Alpha Channel. On the Save to Alpha Box, click OK.
On the New Channel box that comes up, enter a name like Painted Eye and press OK. There! All safely stored for later use, if necessary. Now get to work!. Pick the Cloning Brush from the Tool Palette. The Cloning Brush picks up an area of color from the image and paints with it. Simply put. To use it, first RIGHT click on a spot you want to copy FROM then left click and drag over the areas you want to copy to. Simply put again. Let's explore the Clone Brush options. 1. Go to the third tab immediately and set the Cursor to Show Brush Outlines. It really helps to see how big the brush is while cloning!!!!!! UNCheck Build Up for this example. Go to the Second Tab of the Tool Options Palette and on the Clone Mode drop down box, pick Aligned. Aligned mode means that the Clone source will move in the same direction as the painting Brush keeping the same distance as when you right clicked to set it then clicked to start painting. Mouse over the image without clicking to see the cursor as a circle. The circle size will vary according to the Brush Size! We are ready to work. On the right side of the selection, position the mouse so the circle edge is just outside the selection. Right click to set the clone source. Move the cursor circle just inside the selection, perpendicular to the selection line and click to start cloning. 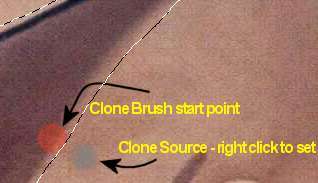 The first click sets the distance and direction between clone brush and the clone source. Now Clickin' and draggin' will lay down the same pixels as are under the clone source at an opacity of 33 percent. Try clicking and dragging just inside of the selection along it to see what happens. Try working from right to left across the selection. With one pass with the clone brush the image should look like the Left Panel. Go over the same area again (no need to reset the clone source ) and another round of pixels will go down at 33 percent. Middle panel. Now it's time to practice. Clone out the purple area in the selection, replacing with flesh colored pixels. The arrows in the image below indicate where you can use the same clone source. When it is time to change direction in order to keep perpendicular to the selection, or where my arrows change color, reset the clone source by moving the cursor circle over the area you want to copy from and right clicking. Then click inside the selection or close to it and continue cloning. 1. Work in small batches. If you make an error, press the undo button or CTRL Z and erase the last bit of cloning you just did. 3. Feel free to set the clone source anywhere on the image you want to copy color from. Since we are concentrating on flesh tones, be careful to match the hue and lightness as closely as possible. 4. Check the Build Up box on the Tool Options palette to build up the opacity each time you drag over the same spot. (As opposed to lifting the mouse button and reclicking and dragging.) Be careful using build up, as it's easy to get too much color in one spot. I prefer to go over an area several times without the build up checked so I can ease the pixels into full opacity. 5. Save the image periodically if you are satisfied with your progress. 6. Empty the Command History buffer to help conserve memory. To do this go to Edit on the Menu bar and Empty > Command History. Beware, it trashes all your steps to date. In other words, there won't be any undoing after you empty the Command history until you go on and do more. 7. The more times you go click and drag over the same area, the more detail you will lay down.. Remember that Grain we talked about earlier??? Try to get as much natural grain cloned into the area as possible but don't stress over it. We will camouflage any blurriness later. 8. Try using the Non-Aligned Mode on the second panel on the Tool Options Palette. Non-Aligned Mode works like this. 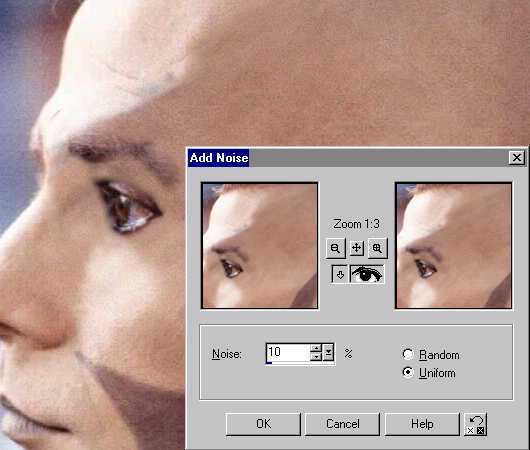 You right click to set the Clone source, then click and drag to paint. As long as the mouse button is pressed down, the clone source follows along like in Aligned mode. The difference is that when you release the mouse button, the clone source hops back to where you originally set it. Non-Aligned mode is handy for cloning from the same area over and over into different locations. 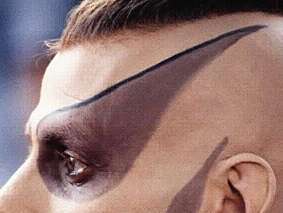 We will do that when we rebuild the guy's hair line in Part 2. When you are finished and happy with your cloning it might look similar to mine. Remove the selection by going to the Menu Bar pressing Selections > Select None. 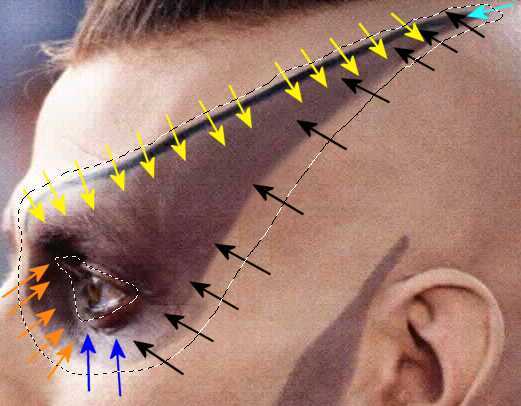 As in my example there might be some "stiff" areas around the edge of the selection. Fix that up by cloning along the selection line with pixels near it. 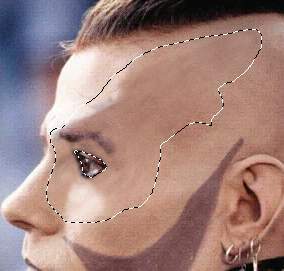 OK. Clean up the area right around the eye by changing the size of the clone brush to something smaller like 10. Zoom in for a closer look. Clone from outside the eye towards the eye, changing the clone source to match the direction you are working. Be careful not to clone over the eye itself. You don't have a protective selection anymore. If you make a mistake, immediately undo it and try again. 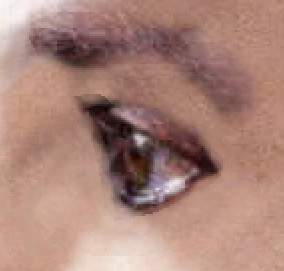 Since the edge of the eye still looks a bit rough, pick the Retouch Tool from the Tool Palette. Pick the Soften variant from the drop down box at the bottom. Work across the "stiff" areas around the eye to blend the pixels with their neighbors. Zooming out to 1:1, notice there are blurry areas where I didn't clone in enough "grain". With the Freehand Selection Tool set to Freehand, click drag a selection around all the areas that lost their "grain". 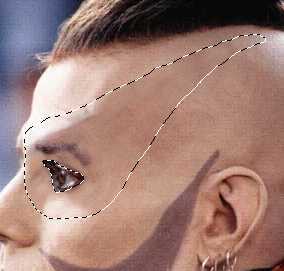 Use the CTRL key and subtract the area around the eye where no cloning or "grain" loss took place. This selection will be similar to the first one, but a bit larger. On the dialog box, press the continuous preview arrow in the middle next to the eye icon to see changes in realtime on the image. Set the type to Uniform by clicking the radio button. Fiddle with the amount slider. Start about 6 percent and work up and down until the noise in the selection matches the "grain" in the rest of the image. I chose a value of 10 percent. Press OK to apply. Remove the Selection. Menu Bar > Selections > Select None. Now see how much better our little boy looks! OK that's enough for today. 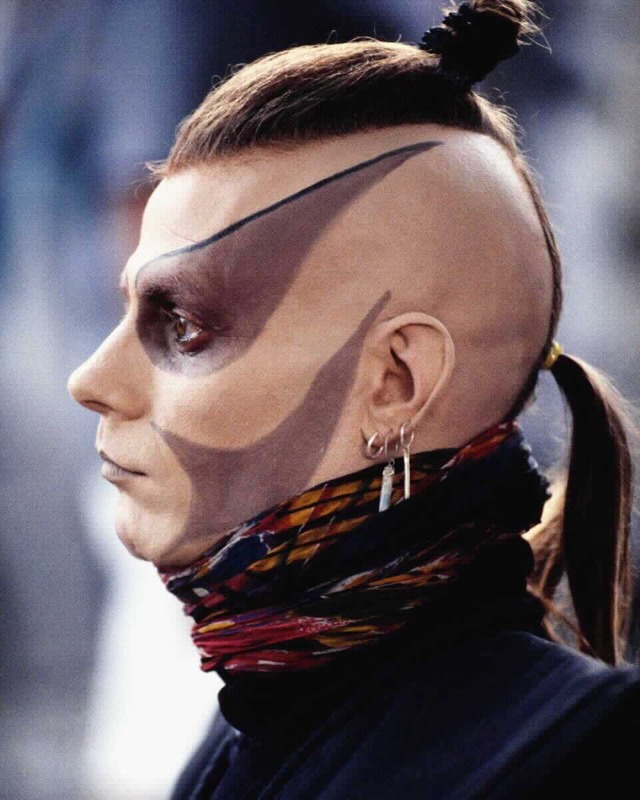 Next time we will cut off his Pony Tail at the top, replacing it with the bluish background using the clone tools. Then we will use a gaussian blur on the cloned blue area to blend it with the rest of the background, and add noise again to replace the lost "grain". If we have time after that we will give him a new hairline, using the Clone Brush and the Brush Tool. A real doozy of a Makeover. After all, we don't want GrandMOM to miss the photo, but we don't want her keel over of a heart attack either.